We came to the end of the line. Gufram pulls back from the world of design, calls it quits with furniture. It declares it and turns the page - with a tombstone. In any case nobody has ever really been able to understand the mission of the interior design company. Everybody criticised the ambiguity of its recliners, that are not really sculptures, since after all in the end they retain their function, albeit latent. There were too many envious people cursing the incomprehensibility of certain products that, after all, look like huge knick knacks. And what about that crowd of mudslingers who have always looked at it askance and have accused it of divulging the wicked and blasphemous word of anti- design? It was time to say stop. It was an unendurable stress for a brand like Gufram, that, through its pop icons, had always desired to give the opportunity to anybody to nurture their imagination within their house, by making pieces which are a little more original than customary with works of coloured, fresh, lively, ironic, and fun furniture. 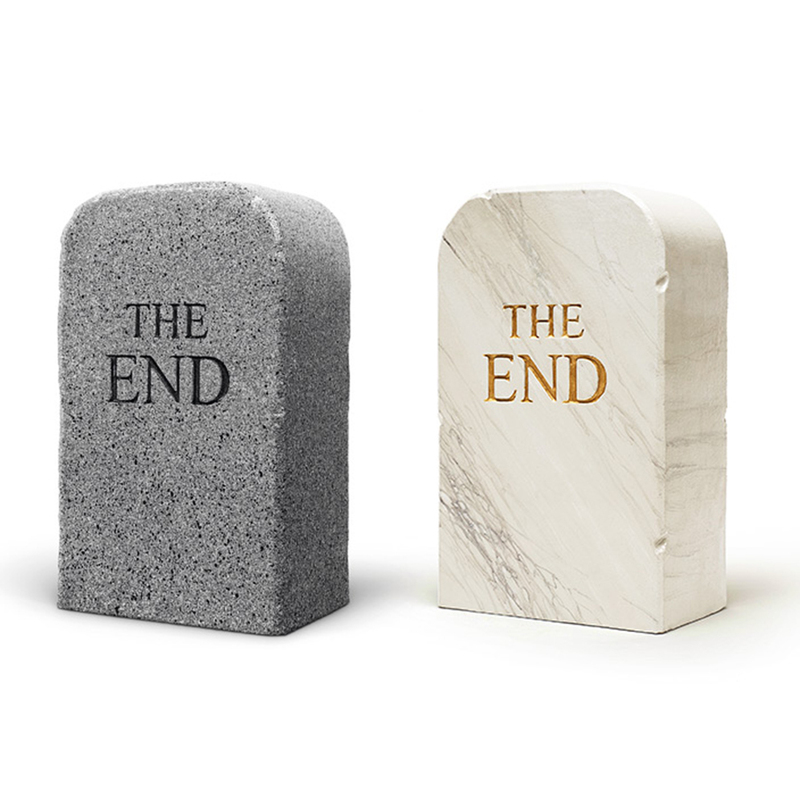 So it was necessary to plan a definitive exit in a blaze of glory, by calling the ambiguous editorial, artistic , photographic (it is hard to understand as yet) project TOILETPAPER, made up of Maurizio Cattelan and Pierpaolo Ferrari, to celebrate the funeral rites. To Gufram’s question: “Maurizio, Pierpaolo, we don’t feel link going on anymore, what shall we do?”, the answer was swift: “Bury yourselves!”. Right! “Write our epitaph!” It was all said and done. Here’s the tombstone by TOILETPAPER, proclaiming Gufram’s end. The End. As a final act of resistance, though, to be faithful to your beliefs, you can sit on Gufram’s tombstone as on a stool. Or you can throw it as a stone against those who have sinned, although in this case you won’t hurt them because it is made of soft polyurethane foam and so well decorated as fake granite that you won’t even notice it. In 2016 THE END is therefore presented in a limited series of "real-faux" Carrara marble, with a gold inscription: this version of the seat is part of the special editions produced to celebrate the fiftieth anniversary of Gufram, established 1966.